I want to start by telling my peeps that had to cancel their date for this evening, don’t worry! You didn’t miss out on much, and I’m sure that it will be better next time so you might as well just come then. I was joined by Mr and Miss Married this time around, two first-timers that did a real good job I have to say. Me on the other hand, did less of a good job to check the pictures I was taking, so they are all a bit blurry, I apologize profusely for not doing the place justice. I met the kids in Central Malmö and then we did a small hike to the restaurant, since I don’t really find my way around Malmö that well either, I had to kick in the GPS on the phone to find our way. It’s easy to spot the place once you reach it, however there were no signs on the outside stating the name good thing for them there are not that many places right there to cause confusion. 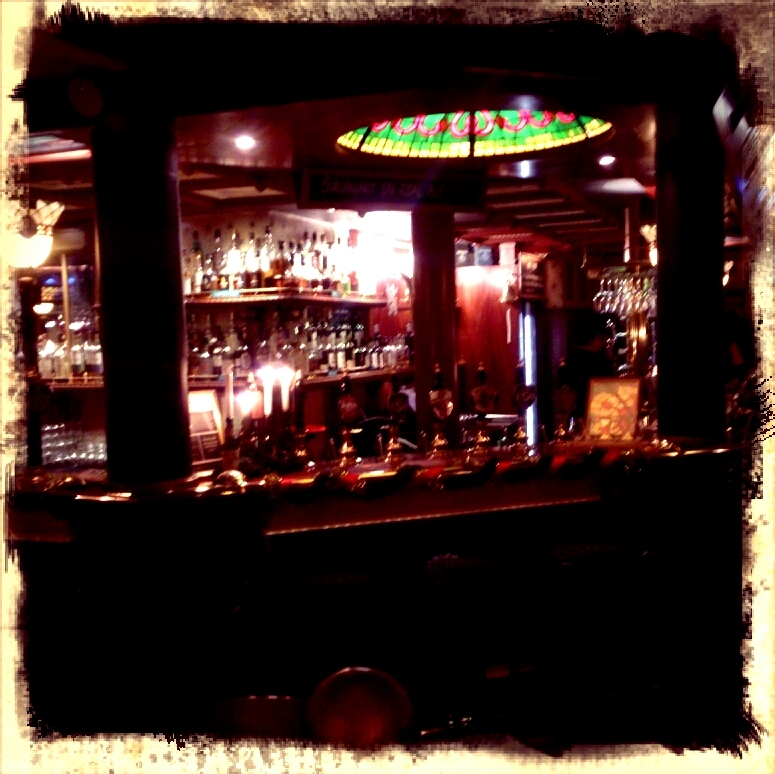 When you first walk in, it looks real cosy, a real nice little bar. 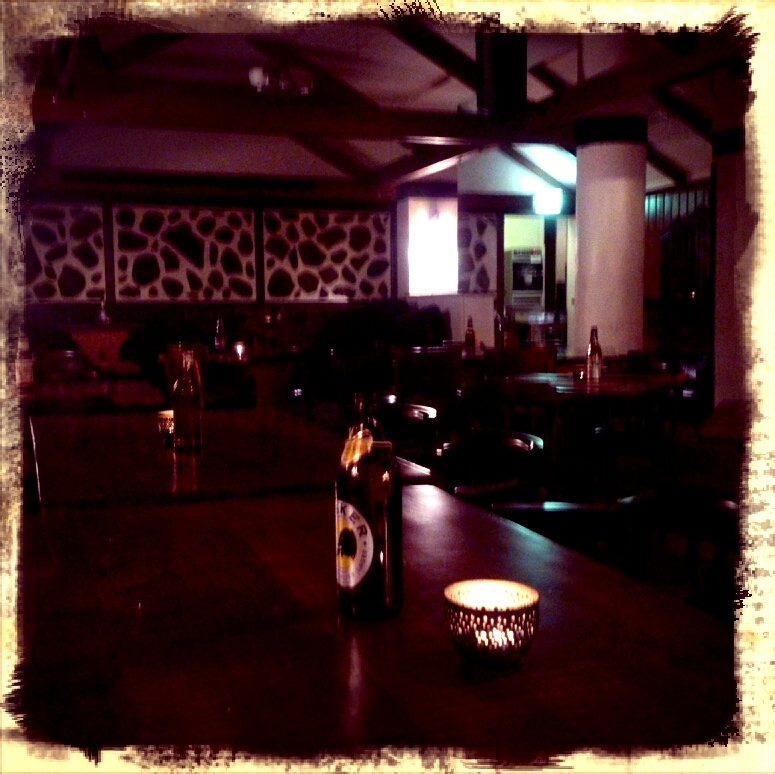 It turned out that I had booked a table in their restaurant part, not as cosy and totally empty. We gave them the benefit of a doubt, since we were early I guess six pm on a Saturday might be a tad bit early to go out and eat. As we were leaving a few hours later, there were loads more people in there. 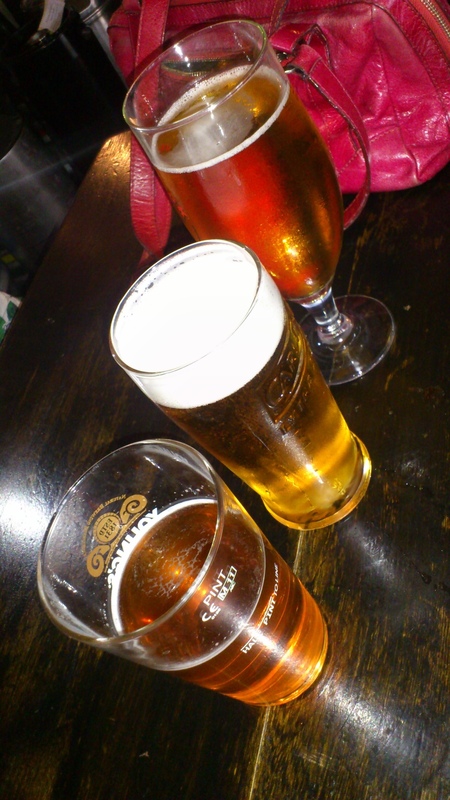 As we all know what we are eating, the biggest task is to choose the beer and here we were informed that the amazing list of international beers that you found on their webpage was only available in the front bar. 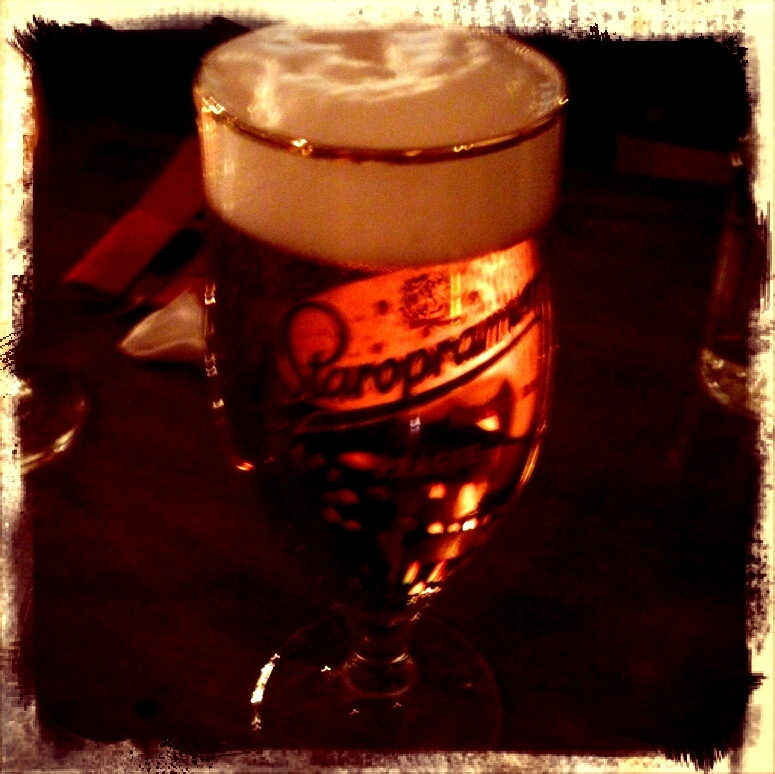 The restaurant only carried Swedish beer (strange as I ordered a Staropramen). Here comes the first main complaint; as we were finishing of our meal, people had sat down at the table next to us and the waitress all of a sudden came walking in with bottles of beer from the bar. Apparently some guests are offered the selection from out there and some, like us, are not! 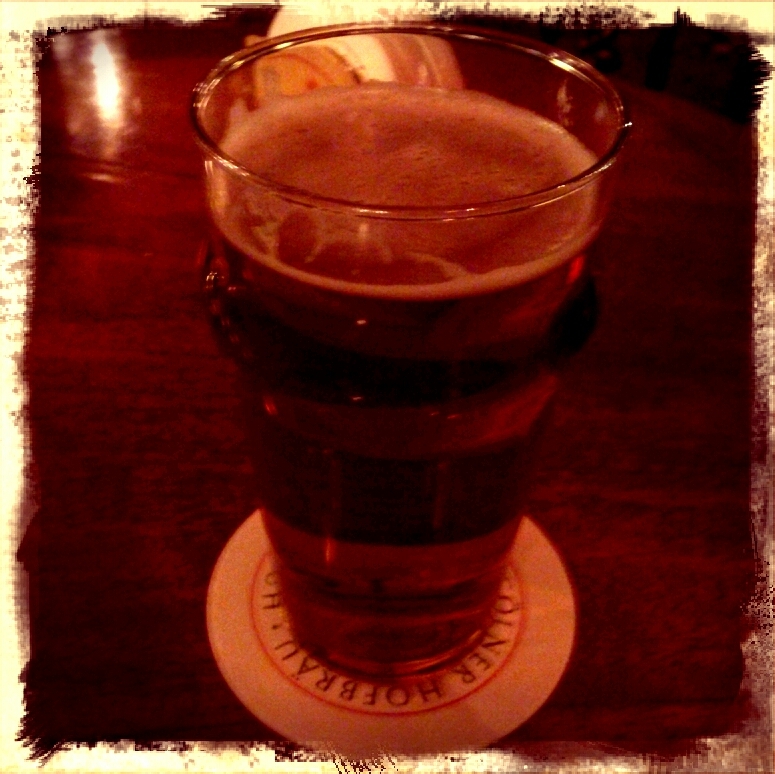 Well, Staropramen works, and I didn’t choose the place for its beer selection, I choose it due to the fact that they had Fish n’ Chips on the menu. They also have a vegetarian option where they replace with the fish with halloumi instead of fish, as Miss Married pointed out, that’s like mozzarella sticks! None of us felt the urge to try it though so I can’t give any input on how it tastes. When the food arrived, we all looked might pleased as it was a real good serving, and looked real yum. Boy did we get disappointed when we started to dig in! Where do I start? Maybe with the “sauce”, this clump of unidentifiable mush contained something so strange that I’m lost for words – curry! Really?!? I wonder who came up with that brilliant idea. Miss Married still wanted something to dip her chips in and we asked for some mayo, which they didn’t have (I would have guessed that there were mayo in the “sauce” which make one think that it wasn’t made on the scene) but we could have some aioli. 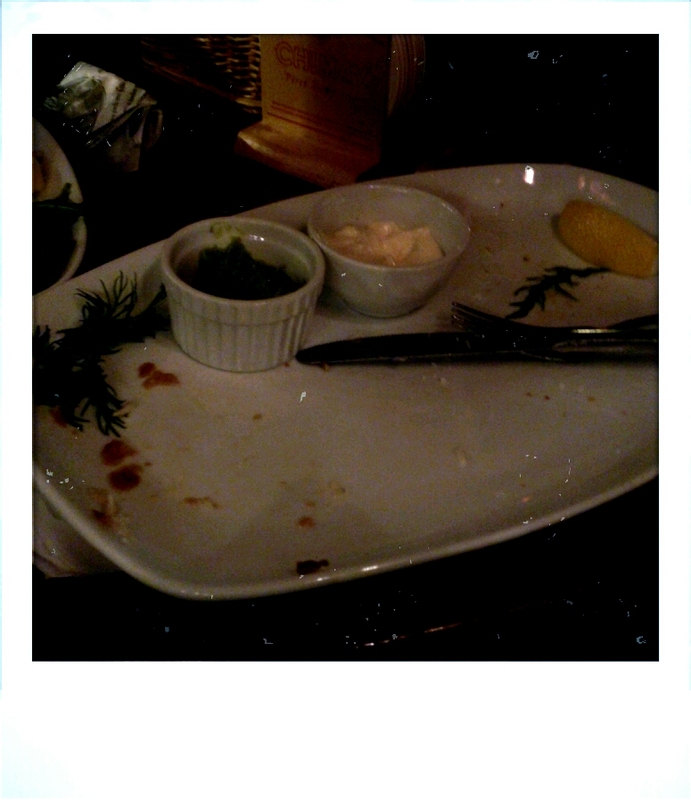 Fine we thought, that tasted ok, it also came with an extra 15kr charge on the bill, not too fantastic. How about the fish? you wonder. Well, it looked real yum and the batter felt real crispy on the outside, however, it was way to thick and as you bit into it you felt a distinct taste of dough. Mr Marrieds fish was one big ball of dough, pretty much, however after digging past the dough the fish inside was real good. We could all agree that it was a well cooked fish with real nice texture (a clear four from all of us). Sad that they forgot to put salt on it, and the lemon was a requirement to get the fish edible. Then the chips, no crunch, no salt, and a bit mushy! What else can I say? Nothing, they weren’t anything special at all. Miss Marrieds favourite part of the plate was the arugula that came on the side, Mr Married was not as keen on eating his greens and I ate them even though they aren’t really a Fish n’ Chip condiment. Conclusion at the end of the meal was that we rather would have been sitting in the bar, as the atmosphere out there was nicer than in the restaurant, also I think we would like to eat something else from the menu as the Fish n’ Chips wasn’t a hit! Too bad, since we want good food for first-timers. Hopefully they are brave enough to show up for more session. The final score was 23,3 which earns them a second place in the Malmö ranking (out of two)! The hunt continues, hopefully they aren’t all that bad! Tonight the Fish n’ Chips challenge moved to Sweden, Malmö to be more exact, and the night contained a newbie named Mini Me Jr and none of the old classics. Something about busy life style and not able to come all the way over the bridge, oh well, lets see what happens in January. For you people who are new to the blog, there is a history here, for a couple of years me and my friends did our best to find the most awesome Fish n’ Chips in Copenhagen. Since the owner of this blog no longer work over there and actually live here life in Malmö the chase has moved to, you guessed it, Malmö. Tonight was the first night of plenty of at least I will get food evenings. Love the touch with the old fashioned newspaper wrapping. It’s sad that the fish tasted like it’s been frozen and re-heated to quickly with all the watery juices making the from the beginning so crispy batter way to soggy. The chips were proper chips, but again tasting out of a bag. There was no crisp when you bit into them, as they were soft with no crunch what so ever. Miss Mini Me Jr got to try here first green pea mush ever, and her plain comment was that it tasted like pea. 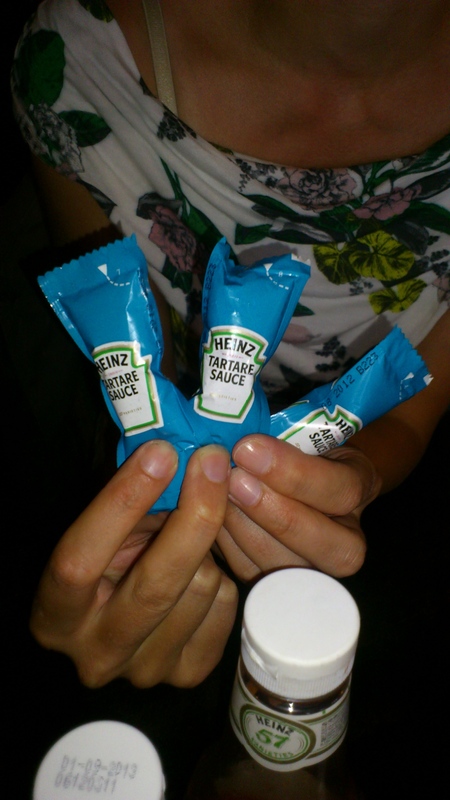 The tartare sauce tasted like mayo only wich caused low grades from both me and mini me Jr as none of us like mayo. Sadly enough this is not a good thing since I’m a real small eater, and if I finish it all it means that the meal is too small. 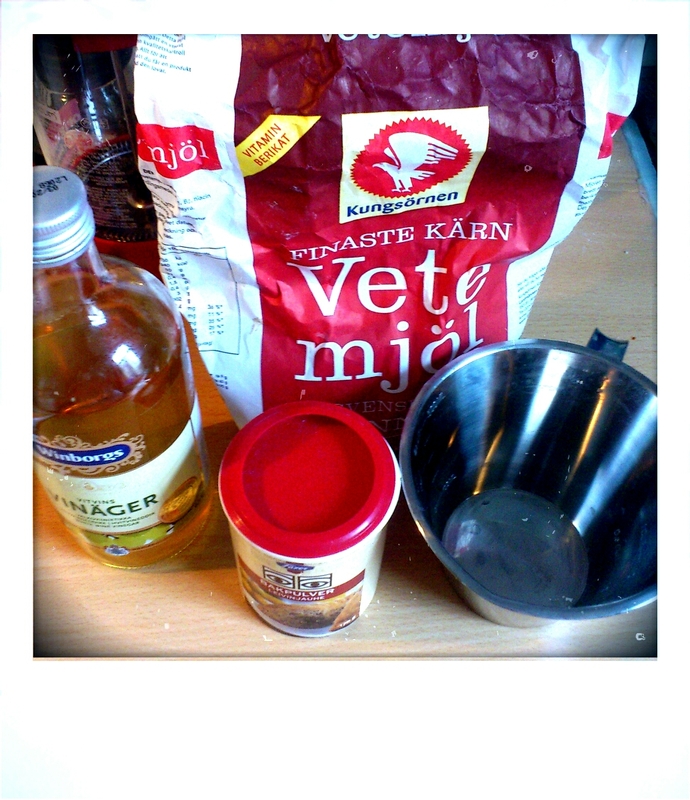 For a 243sek total I have to say it was a bit of a disapointment. At the same time, I am constantly told that there are no nice Fish n’ Chips in Malmö, so who knows, this might actually be the best one. Only time will tell! And just so that you know, when the place is busy, the music is loud enough for you to find it annoying but not loud enough to hear what it is. When the people clear out, it’s not actually that bad! 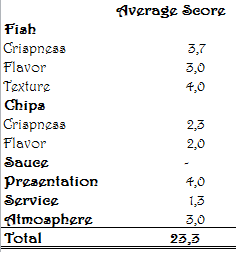 The loyal followers of the Fish n’ Chips challenge knows that the owner of the Sankt Nikolai Pub wasn’t very happy with the review that I wrote after our last visit. 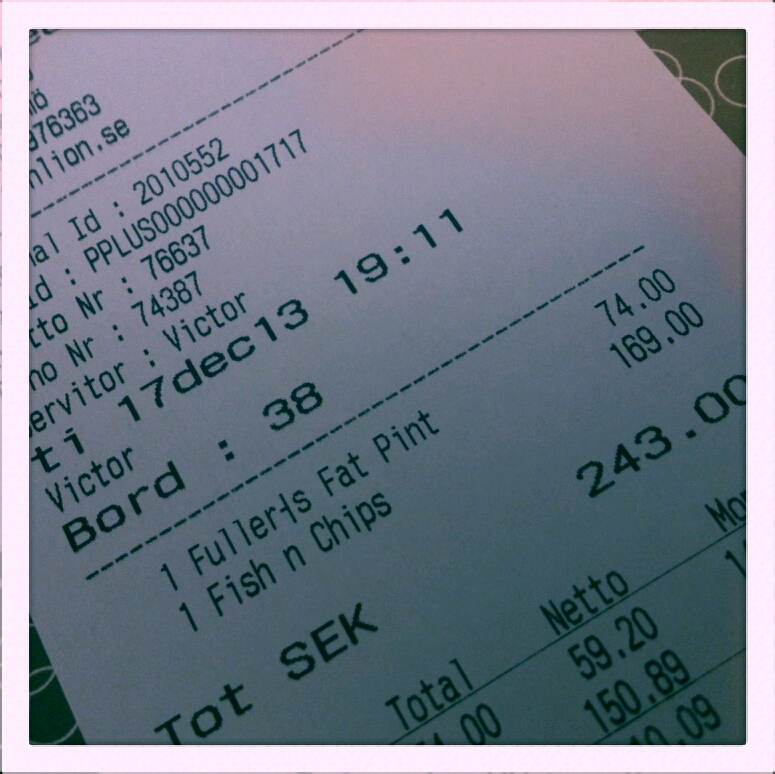 He asked us back for a second try, and so yesterday we made our way back to the Sankt Nikolai for Fish n’ Chips. Remember when reading this, that the time was booked in advance with the owner so he knew that we were coming. We, this time is the same trio as the last time, me, Mr Grumpy and Da Teacher. 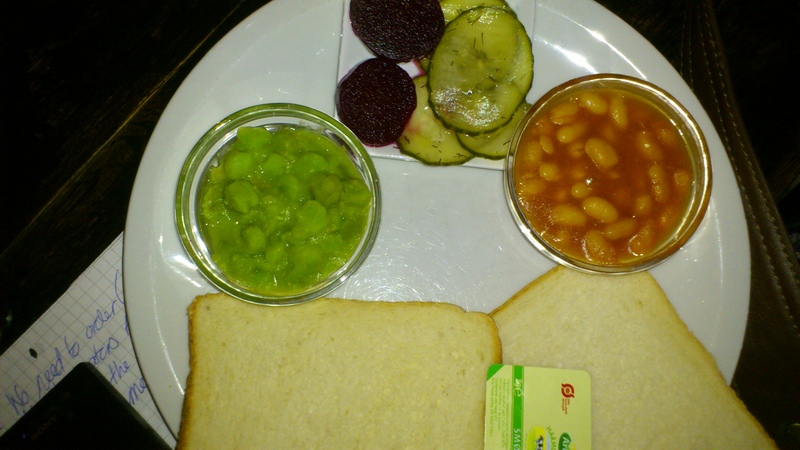 The good thing about booking in advance, and the owner knowing why we are there, is that we didn’t have to order, he came and asked us if we wanted the Mushy Peas etc (Mr Grumpy turned them down, seems he doesn’t like them very much). 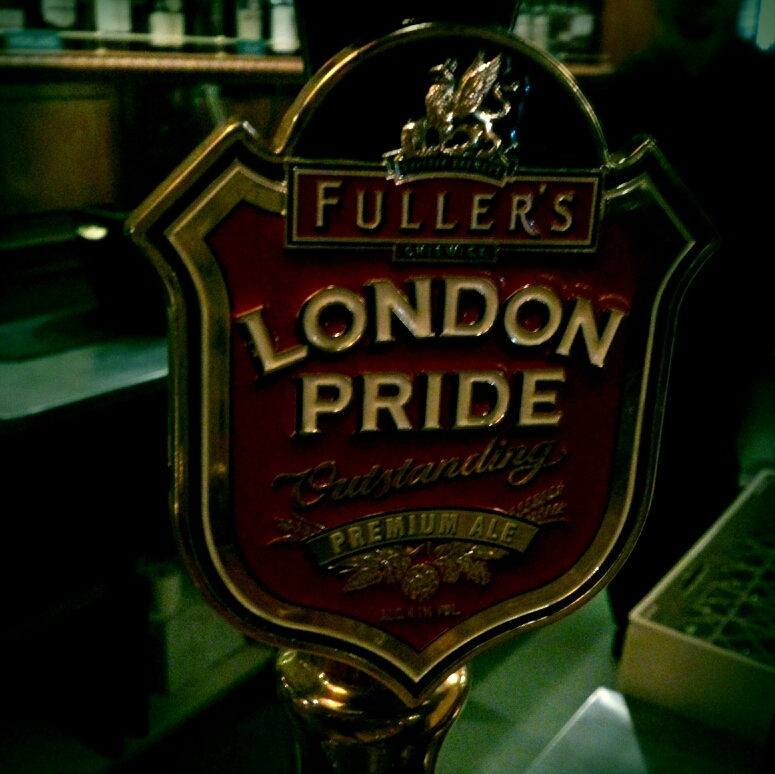 Compared to last time, we were the only one eating when we arrived at the Pub, and food was delivered relatively quickly. Another difference from last time, was that this time around we got the larger portion for 149dkk (the menu has now been updated to clearly show the difference between the two); As we received our food, it becomes clear that the 149dkk comes with Baked Beans, which Da Teacher thought went very well together with Fish n’ Chips, as well as bread, pickles and beetroot. Trust me you do not walk away from this meal hungry. This time, we got the large plates that we saw other guests eating of the last visit, and now we know the difference; if you order the cheaper alternative, you get a smaller plate, if you order the more expensive alternative you get the larger plate, even though the sides are served on a separate plate. This time around, the chips were all from the same bag and warm, not warm enough according to Mr Grumpy where as Da Teacher had burns on her tongue from eating her first. 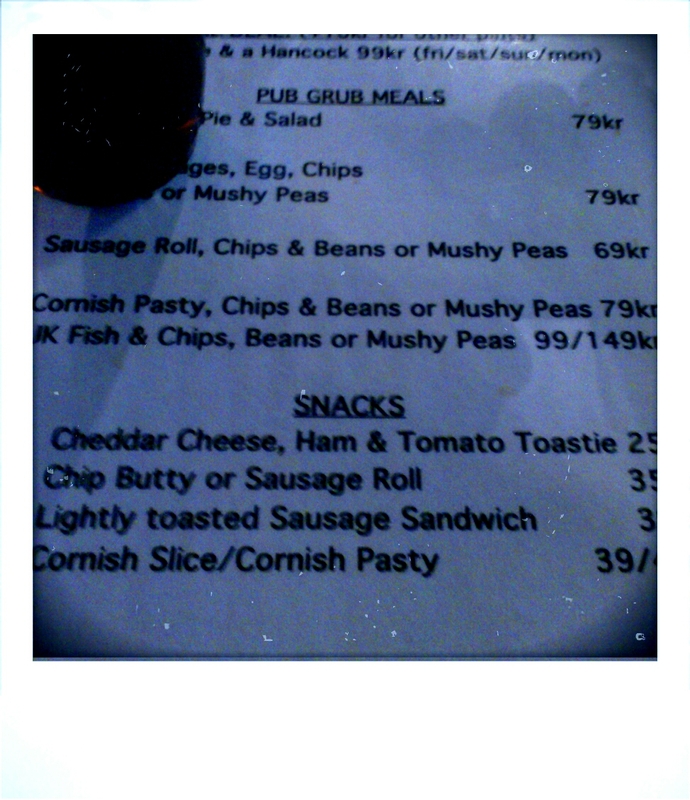 The mushy peas were warm as well, which we all agree should be the case. 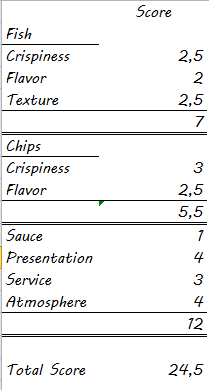 Then we have the Tartar Sauce, a requirement and something that we grade in this Challenge, the last time it was completely missing, this time it had been ordered and we received small sachets of Heinz Tartar Sauce. 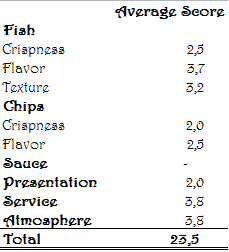 I wouldn’t say it is the best sauce we had, however it was present and brought up the grade from 0. All in all, the experience this time was better, and the score show the same as Sankt Nikolai (the 149dkk attempt) brought the Pub up to a second place in The Best Fish n’ Chips in Copenhagen challenge. It is always said that you shouldn’t judge someone before you walked a mile in their shoes, I guess I have been doing exactly that as I have been visiting places around Copenhagen judging their Fish n’ Chips. 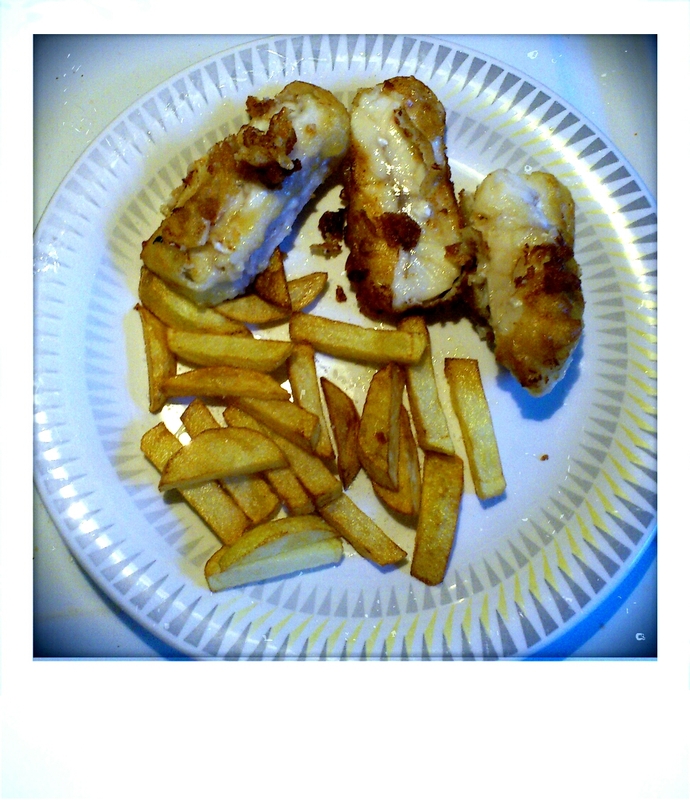 That ended this evening as I made my first attempt on my very own Fish n’ Chips. I will have to start with admitting that it was a lazy attempt, since the rain was pouring down outside accompanied by some thunder, there was no way that I would go out to the grocery store. 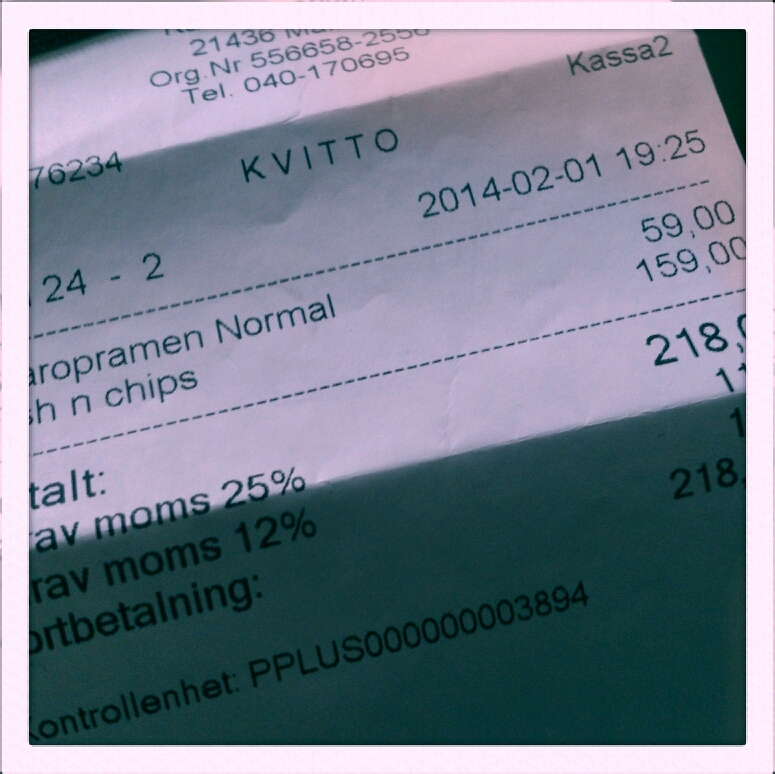 So starting with the potatoes, I found two small little things in my kitchen, so these chips are dubbed “baby chips”. 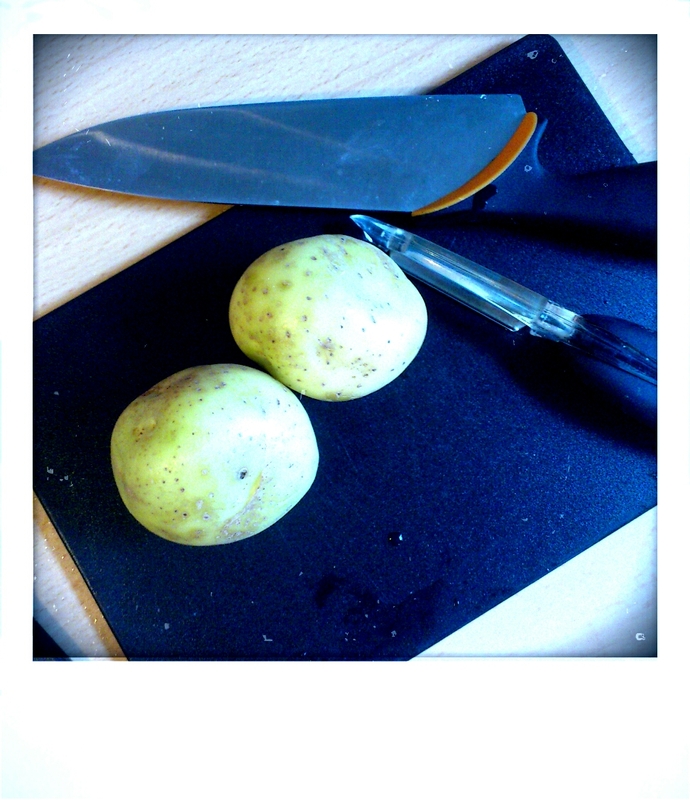 Basically I peeled them and tried to make them into as square of chips as possible (note to one self, for next attempt buy BIG potatoes). Once that was done, I did what every child of my generation would do, I googled for batter recipes until I found one that contained items that I had at home. I have to say that the batter tasted really well, not sure the lack of thickness was due to the frying (will talk about that more later) or the batter it self. 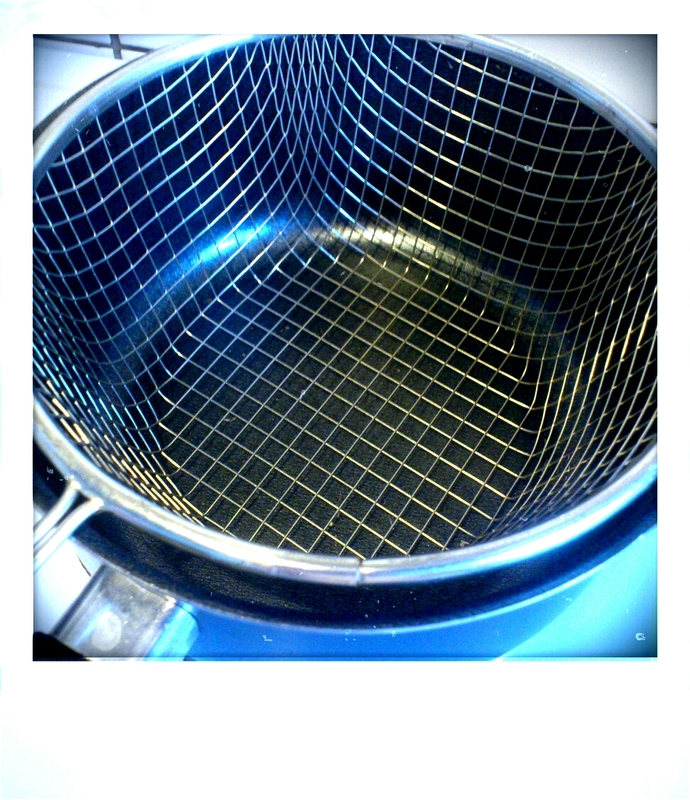 If any of you out there have any good batter recipes please let me know and I will try them out. For the fish, I used some Cod that I accidentally had in my freezer, yes I used defrosted Cod, again, I refused to leave the apartment due to the weather conditions. I realized after I chucked the fish in the pan that I should probably have cut it in half as it was way to thick and thus there was no way that I would be able to cook it all the way through. And then for the frying, I have a proper pan for it, my mother was kind enough to let me have the one she used when I was younger and fried food was last in fashion, she never used it anymore anyhow. I just miscalculated how much oil you really needed to fill it up properly. The other thing was, that the only oil I had at home was olive oil (not the best for frying I heard), thus I think you all understand my dilemma. For the next attempt there will be proper oil in a very large bottle, available (I also need to buy more olive oil as I am now all out), that is for sure. The fish, or the batter rather, got stuck to the bottom and there are more batter there than was actually left on the fish. The most hits that I get on this blog are in relation to Fish and Chips, this due to the aim of finding the best Fish and Chips in Copenhagen. It is nice, I have a reason to meet up with my friends and have a nice evening over some food and a fun time grading it once we finished. It is also nice that there are Pub owners in Copenhagen that find this blog and let us now that they are serving Fish and Chips so that we can come and try it. 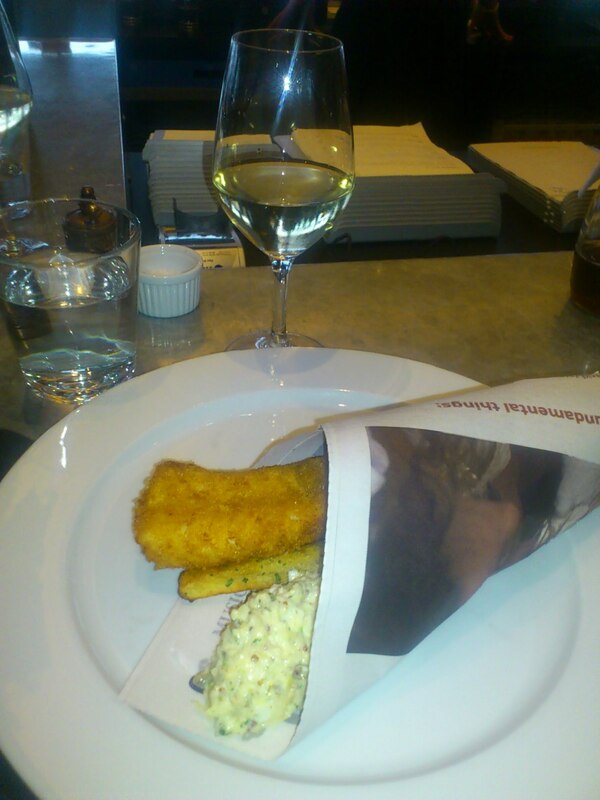 We will of course make a second attempt on the Fish and Chips at the Sankt Nikolai Pub, how can we not? Watch this space for the outcome. 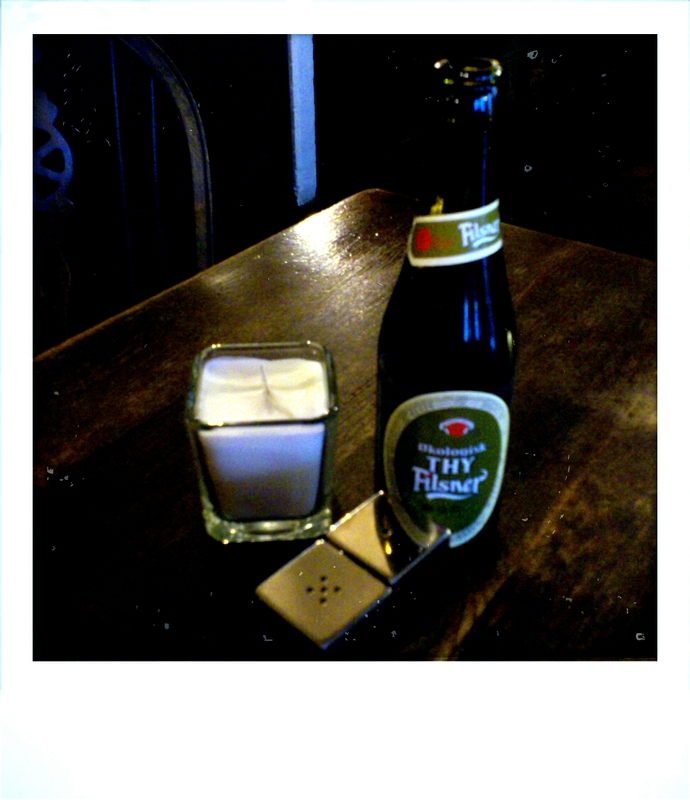 Today’s outing brought us to the Sankt Nikolai Pub, which on this very blog has claimed to be a genuine English pub. 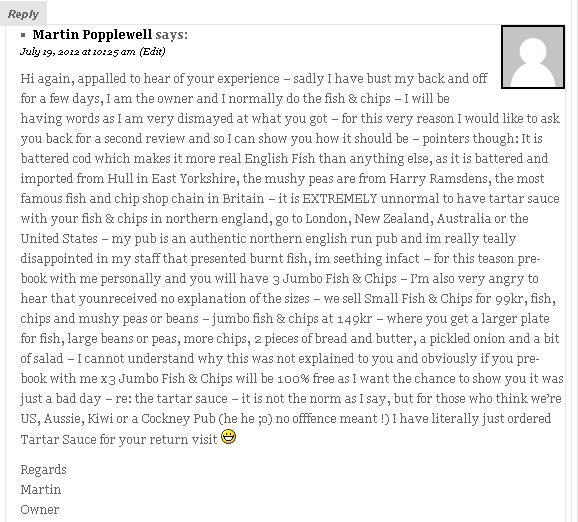 How can me and my fellow fish and chippers resist such a challenge, and of course anyone that tracks down my little Fish and Chips experience and makes a comment deserves a visit. Joining me today was the wonderful Da Teacher and Mr. Grumpy himself, the longest running fellow fish and chippers. We were running a bit late and once we were all gathered I was starving, and some of the tables around us were receiving their fish and chips as we were waiting, don’t make life easier at all. Pretty much the moment that Da Teacher sat down, I went up and ordered for us and not long after that the waiter came over to our table to tell us that there was a 20 minute wait before we could get our food. It was appreciated that he came and let us know still the wait is no fun; it’s not a good sign when the restaurant is maybe filled to a third of its capacity and the kitchen can’t deliver. Well, we managed to entertain ourselves drinking our beer and chatting away and all of a sudden the food was in front of us – not a very impressive sight I have to say. 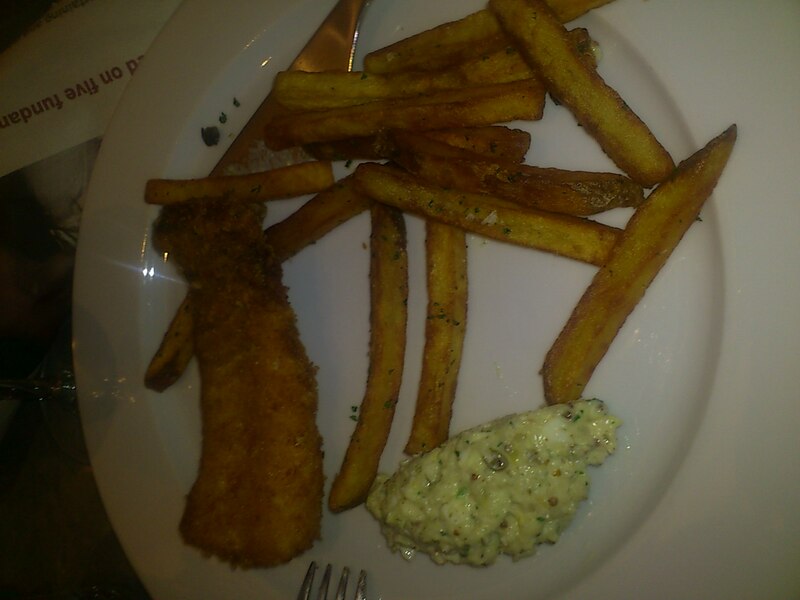 The plate was not big enough for the food, my fish was obviously burnt and where is the tartar sauce? For a pub that claims, according to their menu, that they server UK Fish and Chips I would assume that there would be some tartar sauce available. And the plate size, the couple that was sitting at the table next to us had large square plates where the food looked so much better. 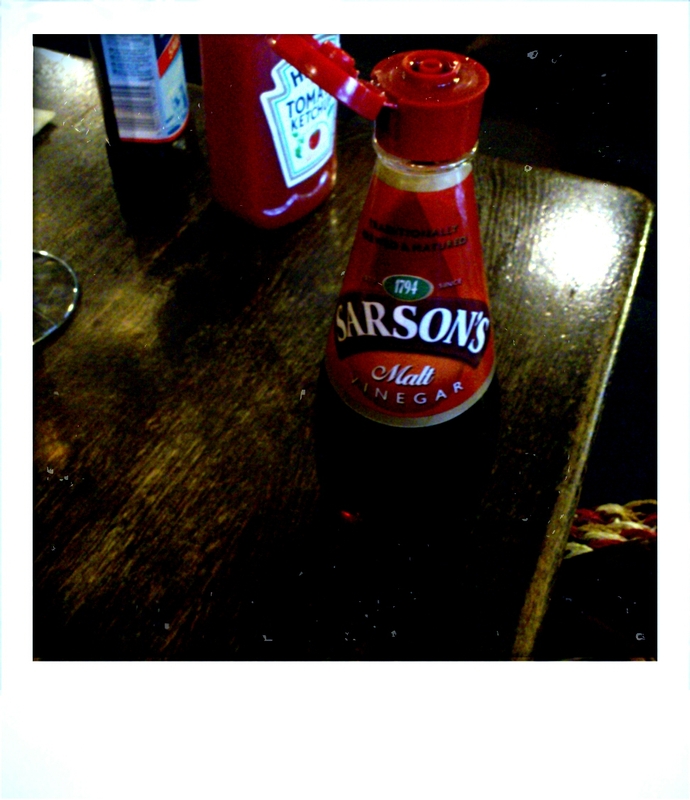 There is a big plus, from Mr. Grumpy our very own vinegar specialist, the vinegar placed on our table is the real vinegar from Sarsons, Da Teacher also enjoyed some brown sauce with her food. Yes, we still call it food, and one of the measurements that we have is the crispness of the fish, unfortunately for us today we met too crispy fish, mine where crispy to the point of burnt on one end. Da Teachers was perfect on one side and soggy on the other side. 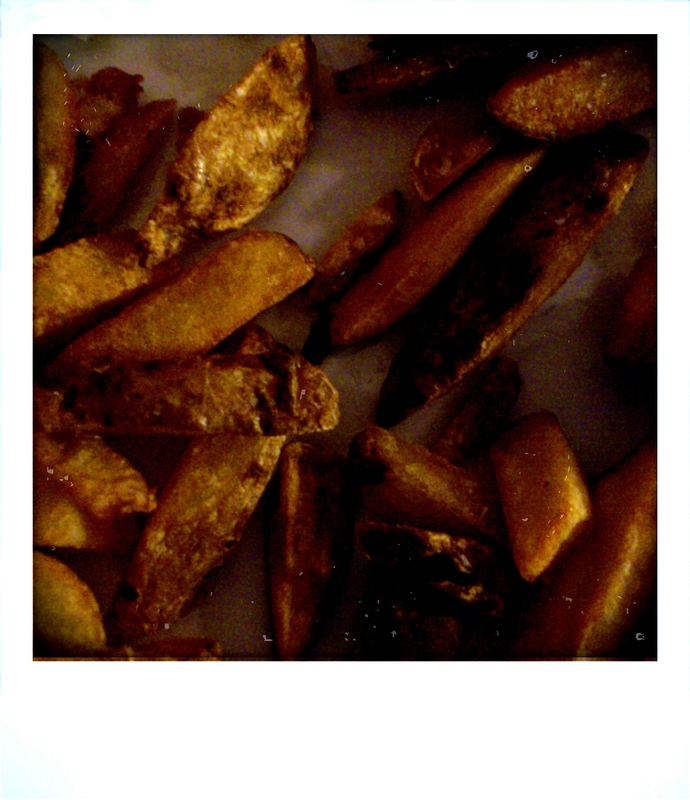 The chips also seem to have come from different bags of chips; my plate looked like the last bit of one bag with all the tiny bits that sink to the bottom as the large yummy chips are firstly poured in to the fryer to become nice golden crispy chips. Mr. Grumpy had some of that together with more big chunks, and Da Teacher where happy with hers. 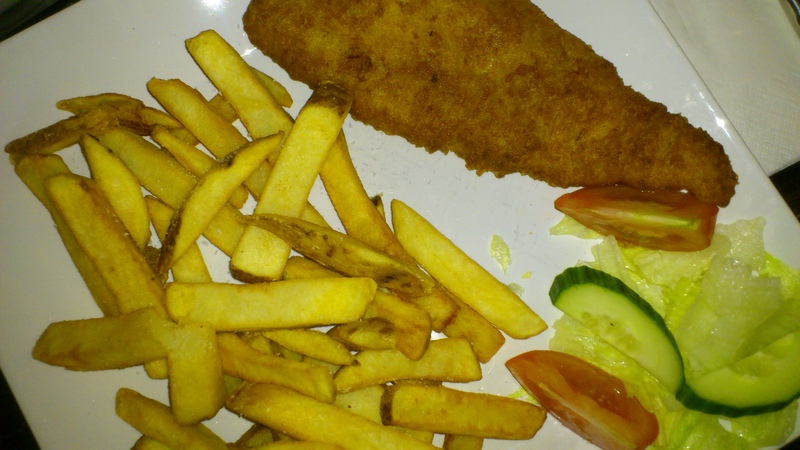 Of course the little bits I had were crispy, the rest was soggy and their heat didn’t match the heat of the fish. It felt like the chips were ready 20 minutes before the fish and then kept warm while waiting for the fish to finish. When it was time to pay for the food, confusion meets us. 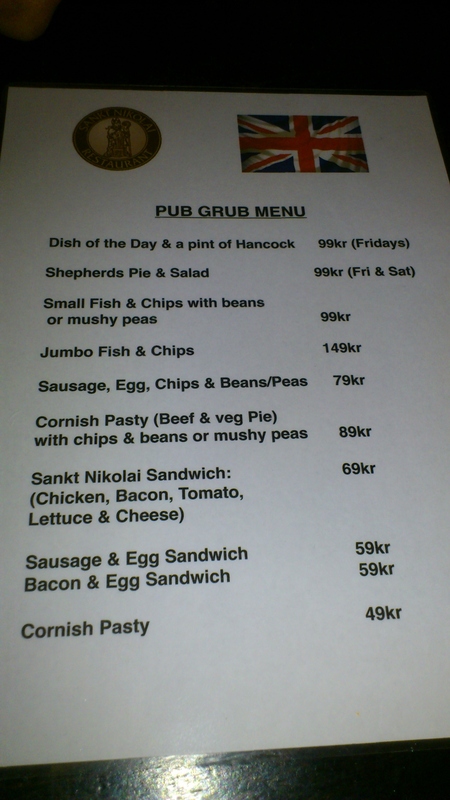 There are two prices on the menu and it is not clear when which of the two prices were applicable, not even the guy behind the bar seemed to know for sure as he first charged me the higher price of 149dkk and then when I asked about the lower price of 99dkk he apologized profusely and let me have the food for 99dkk. Overall it is a nice little place in a good location, just a few minutes’ walk from the metro station; it does however not have the best Fish and Chips in Copenhagen, check here to see where they ended up in the ranking. 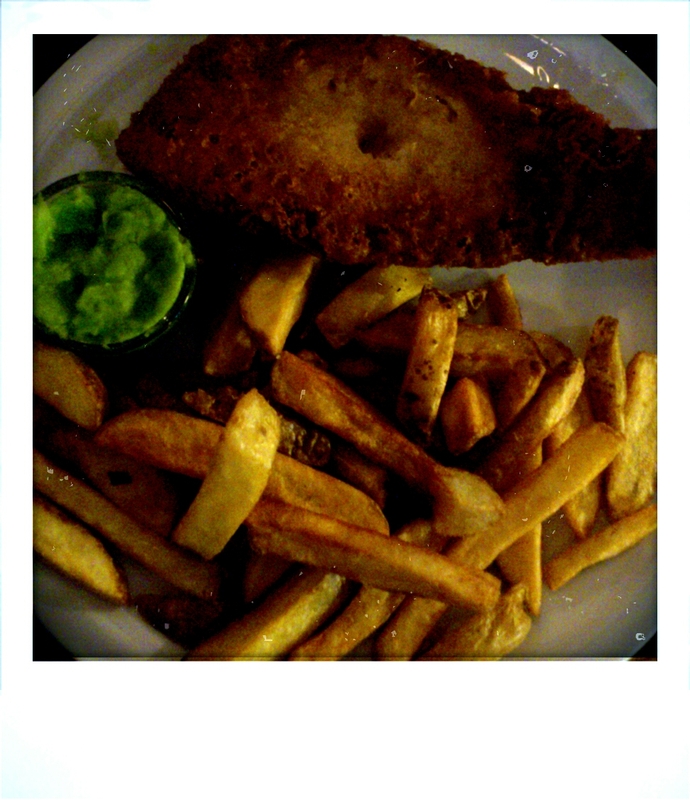 First Fish n’ Chip session in 2012 and the expectations were high. This time our challenge took us back to Copenhagen’s Meatpacking district and my fingers were crossed that the experience this time wouldn’t be similar to the one we had last time we paid a visit. My brave co-fishers was the forever-present Da Teacher and a newcomer to the bunch, Miss Paraguay. When we arrived it turned out that it is a proper restaurant at the fancier way and a table reservation would have been in place, they did however manage it for us by placing us at the bar. We were given ample time to sit down before the menus were provided, the ordering was quick though since we already knew what we wanted. The wine order (yes, we had wine this time rather than beer, might have been the absence of men that did it) took a bit longer, we did leave it up to Da Teacher who, with her vast experience of wine, found us a very fresh white wine that went well with the fish, a Sevre et Maine Muscadet. 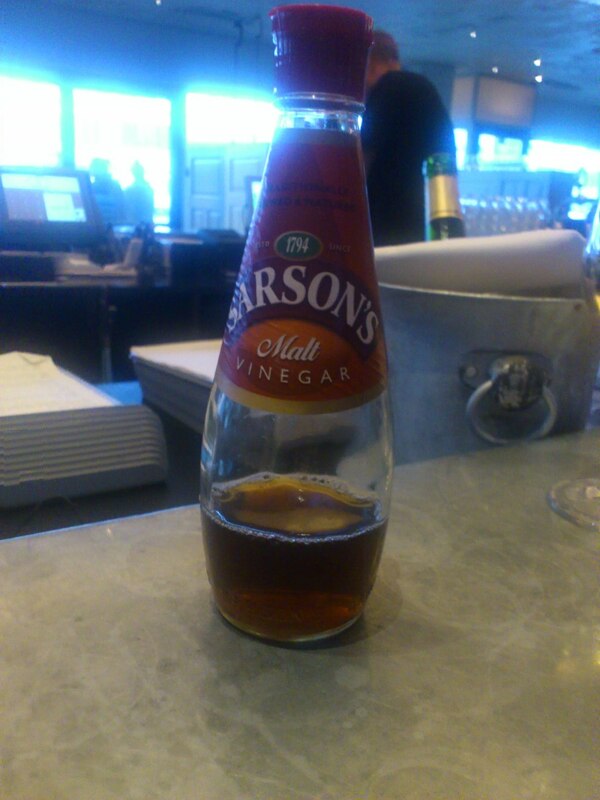 Once the Fish n’ Chips were ordered a nice looking bottle of Vinegar was put in front of us, and both me and Da Teacher immediately thought about Mr Grumpy and how he would have appreciated it, as this is usually one of the most important issues for him. None of these three ladies even tried it to my knowledge. The food was delivered quickly and in very nice looking news paper wrapping, pouring it out on the plate was the first disappointment of the evening as the portion was extremely small. One have to remember that the dish is listed on the menu under their medium dishes, it didn’t look like it was enough to fill you up though and as we later realized, it didn’t (the writer ended her night at McDonald’s). 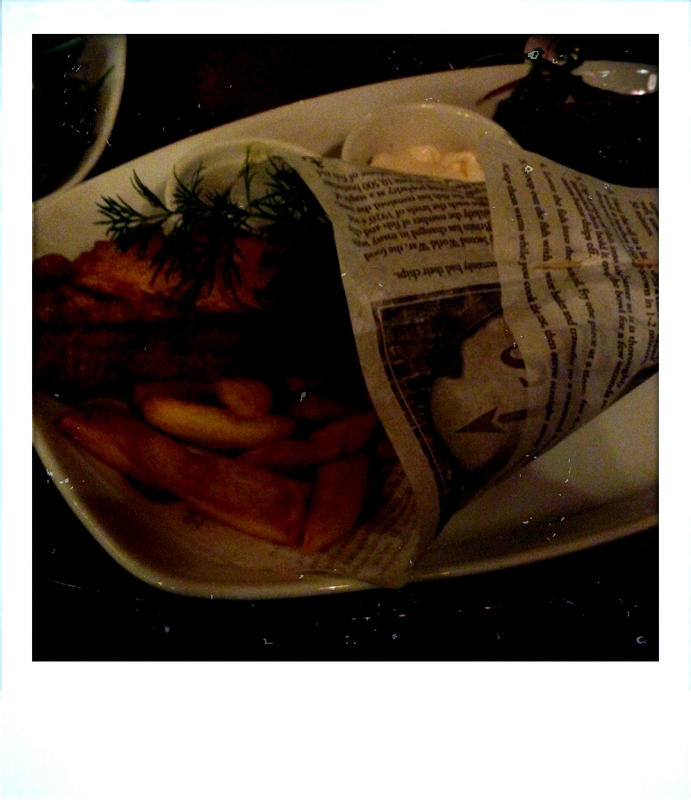 The fish of the evening was Pollack, which was decided is not a good Fish n’ Chips fish at all, mine was too soggy as well as burnt in one end. The sauce wasn’t really a sauce, but rather a clump of semi-identifiable ingredients that would have been great on a sandwich rather than on the side of Fish n’ Chips. And as to the chips – they weren’t! Once again we meet a plate that contains fries rather than Chips, so once again there are no score for crispness, the seasoning was however excellent and they were fried to perfection. 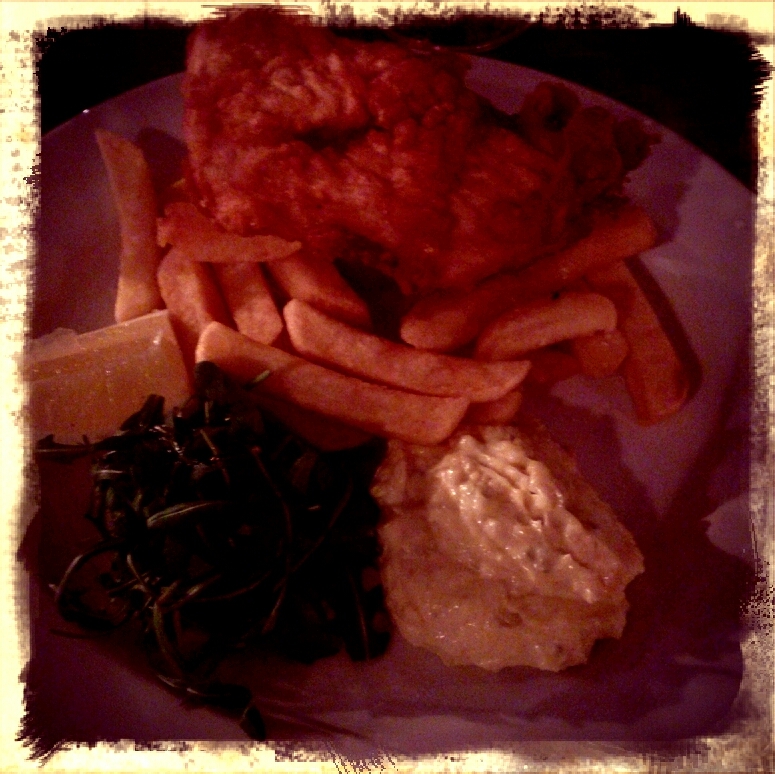 One of Da Teacher’s favourites of the evening was the deep-fried capers that came with the fish. Something that was less appreciated was the healthy runners that passed the window of the restaurant every now and then, healthy people and deep-fried food – not the best combination, not the fault of the restaurant though. 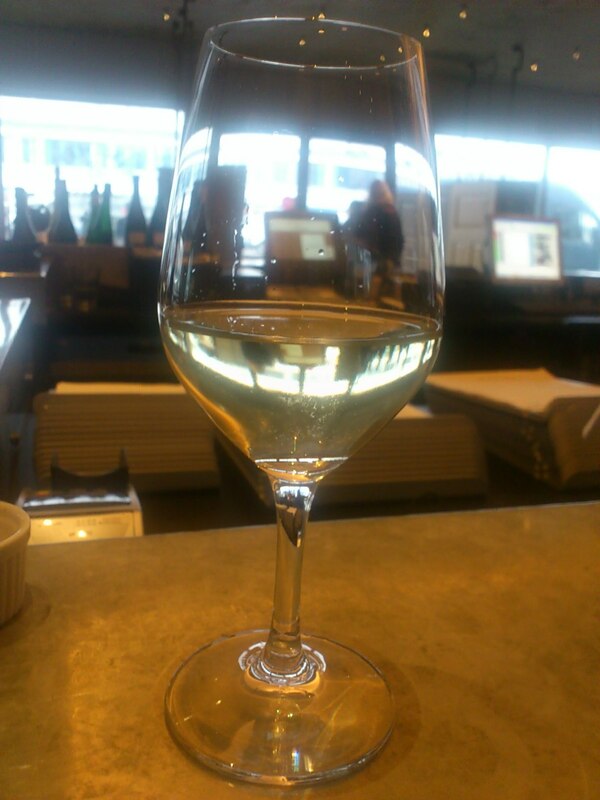 The final score landed on a decent 27.5, and at the time of writing a third place, not too bad at the price of 100dkk (plus the wine of course). Do you want to see the rest of the list? You find it here.